The average person contracts the cold around 200 times during his or her life. At an expected lifespan of 79 years, that’s two and a half potential trips to the doctor, coughing fits, and sick days from work annually. If you’re trying to avoid becoming a sickly statistic, it’s worth noting that the places where people often pick up the cold or flu typically have two things in common: crowds and germs. With nearly 78,000 types of bacteria and viruses in the average public restroom and more germs on airport security bins than you’d probably care to count, you’ll have something different to think about when rubbing elbows with own-of-town relatives over a holiday meal this year. 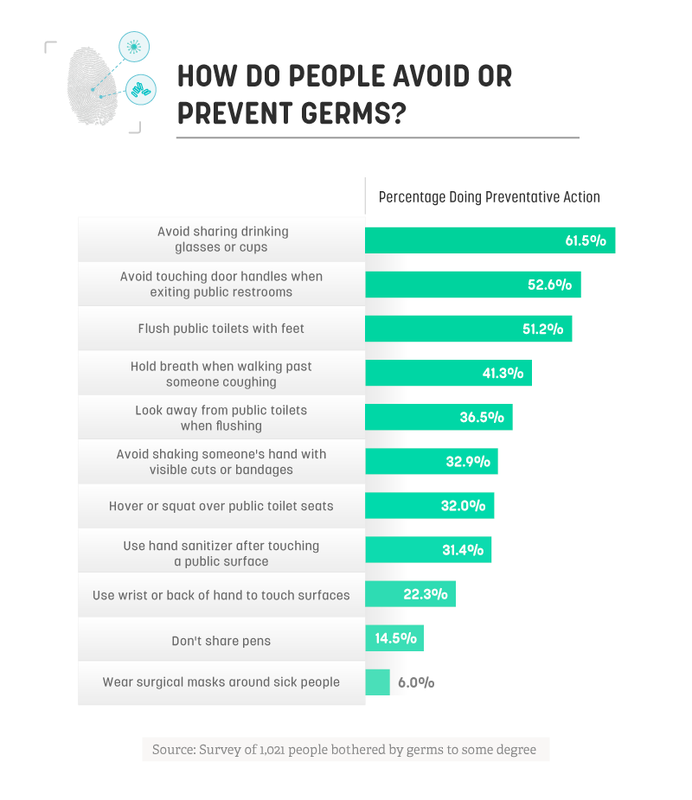 We surveyed over 1,000 people about their germy pet peeves and the actions most likely to result in contact with germs. Does washing your hands mean you’re less likely to catch a cold? What about picking your nose, or using your hand to flush a public toilet? Read on as we break down people’s biggest germ concerns and offer ways to navigate these bacteria-laden environments. There are plenty of surfaces in your home that contain more (potentially hazardous) bacteria than a toilet seat: Look no further than your pet’s food bowl or your smartphone (yeah, it’s pretty gross). That doesn’t mean you shouldn’t feel anxious about using public restrooms, however. In fact, it’s usually the surfaces surrounding the toilet – the ones that get covered in sprays of dirty water droplets – that are the biggest culprits of contamination. Perhaps most people aren’t doing enough to keep those bacteria at bay. More than 2 in 5 people admitted to flushing the toilet without first closing the lid. Nearly 1 in 3 also left dirty dishes in the sink, potentially letting a mass of germs pile up in their kitchen. While less common, roughly 1 in 10 people left expired food in the fridge, sneezed into their hands and ate without washing, or talked while chewing their food. The more comfortable you are around a person, whether it’s a romantic partner or family member, the more likely your behavior will reflect that comfortability. In addition to skipping a shave session or worrying less about passing gas, you might not be as worried about spreading germs to the people you know. In fact, 71 percent of people were willing to drink from the same glass as their partners, and almost 58 percent were comfortable going back into the same food dish twice. Sadly, the mouth is one of the fastest ways to spread germs, and the love you share won’t prevent you from getting sick if either party is carrying something contagious. While that comfortability diminished among co-workers and strangers, certain actions were still considered unacceptable regardless of the company. Nearly 92 percent of people said it was never OK to pick your nose and eat the findings (which is risky because of the germs you might be putting in your nose rather than pulling out), and another 88 percent said the same about failing to wash your hands after going to the bathroom. If germs really are everywhere (and they are), how can you avoid the nasty bugs that could make you sick? Whether these efforts are effective, many people are at least cognizant of the potential for spreading bacteria. Nearly 62 percent of people said they made a conscious effort to avoid sharing drinks with other people. 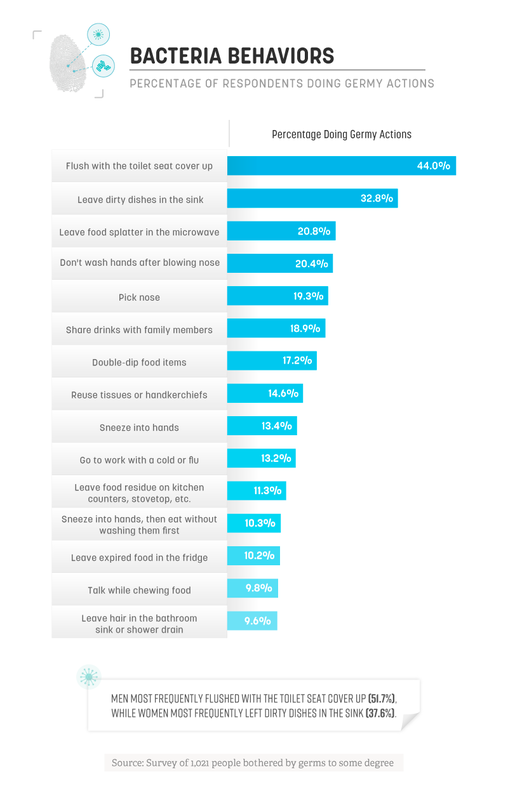 More than half agreed on the value of not touching the exit door handle in a public restroom, and nearly as many made an effort to flush public toilets with their feet instead of their hands. But there are even more people can do if they want to avoid getting sick. Even though wearing a surgical mask can help prevent picking up airborne illnesses (including the flu), just 6 percent of respondents wore them around sick people. Women might have a stronger inclination toward staying clean – but avoiding bacteria may not make them any healthier. Even though they were more likely to avoid sharing drinks, hold their breath while walking past someone coughing, and look away from a public toilet before flushing, women still got sick more often than men. Compared to roughly 41 percent of men who said they were ill more than once each year, more than half of women said the same. There’s more to avoiding cold and flu season than monitoring what you come in contact with, and daily nutrient and exercise levels play an important role in keeping the body healthy. A mild headache. The slight tinge of body aches. Congestion, or even just a runny nose. These are among the most common and telltale signs that you’re getting sick. Try as you might, if someone blows their nose or sneezes near you, you could be exposed to whatever pathogens they’re carrying. Most people were more concerned with exposure to strangers and public places than they were with people they knew. Public transportation, air travel, big crowds, and even ride-sharing services ranked among the most concerning environments for germs, while family holiday gatherings and gatherings with close friends were the least worrisome. While more crowded spaces can be a haven for germs and contamination, friends and family can still get you sick if they are feeling under the weather. Women weren’t just more likely to get sick compared to men – they were also more likely to be concerned about germs in public places. While less than 31 percent of men were concerned with germs on public transportation, more than half of women said the same. Those fears might not be misplaced, either. One study found 900 times the number of germs in a New York subway car than on a standard airplane tray table. If that isn’t cause for carrying around hand sanitizer, what is? 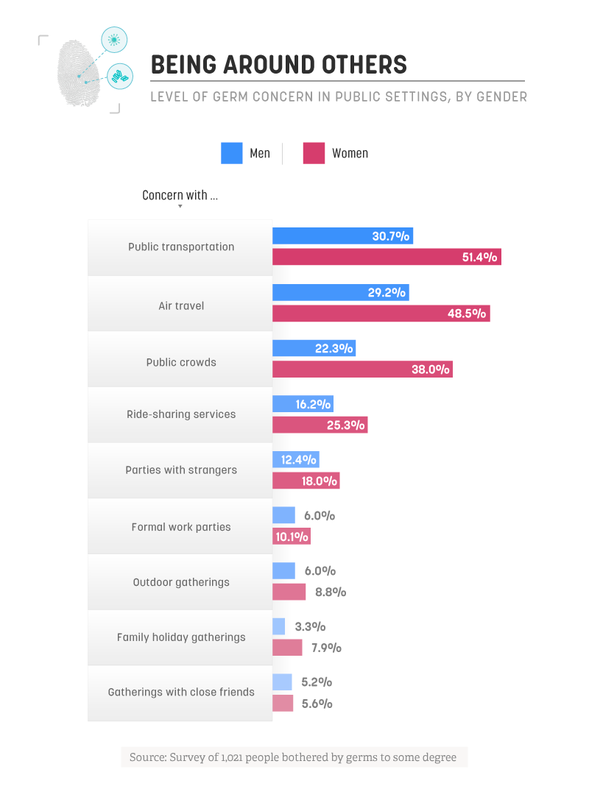 Women were also significantly more worried about air travel, public crowds, and ride-sharing services when it came to germs. In fact, while men were still worried about germs in many of the same environments, their concerns failed to outweigh that of women in every example. When it comes to preventing a cold or the flu, you have to do more than focus on strangers and their germs. While places like the airport or public restrooms are crawling with all sorts of nasty bugs, most people aren’t concerned enough about the pathogens they could be picking up from the people around them. Even women, who were more conscious of germy environments, were more likely than men to get sick multiple times in a year. When it comes to taking care of your health, SingleCare has your back. In just three simple steps, we’ll help make sure you’re getting the best deal on your prescription medications. Whether you’re traveling out of town for the holidays or hosting an intimate gathering, you never know what you could pick up during cold and flu season. With SingleCare, you can find your prescriptions, compare pricing, and save at the pharmacy. It’s that simple. Visit us at SingleCare.com to start saving today. Our data is comprised of a survey of 1,021 people bothered by germs to some degree which was gathered via Amazon’s Mechanical Turk. Our demographic breakdown used in the project were as follows: 44.9 percent of our participants were men, and 55.1 percent were women. Participants ranged in age from 19 to 80. The mean for our age range was 37.4, and the standard deviation was 11.5. Demographics with a sample size below 26 were excluded from our analysis. Data presented in this study rely on self-reporting and statistical testing was not conducted in this study. 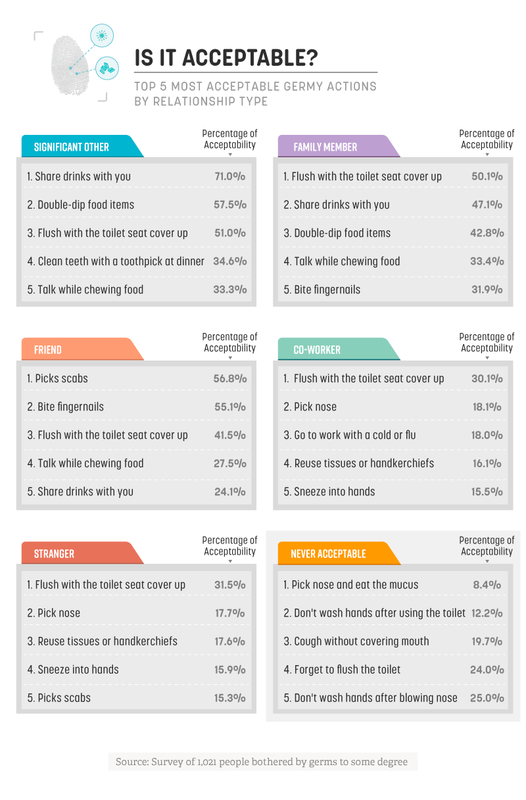 While you may be afraid of sharing germs, there’s nothing to fear with sharing this study. The findings and all of the related graphics are available for sharing with your own audience for any noncommercial use with a link back to this page.